We have Good Things in Store. 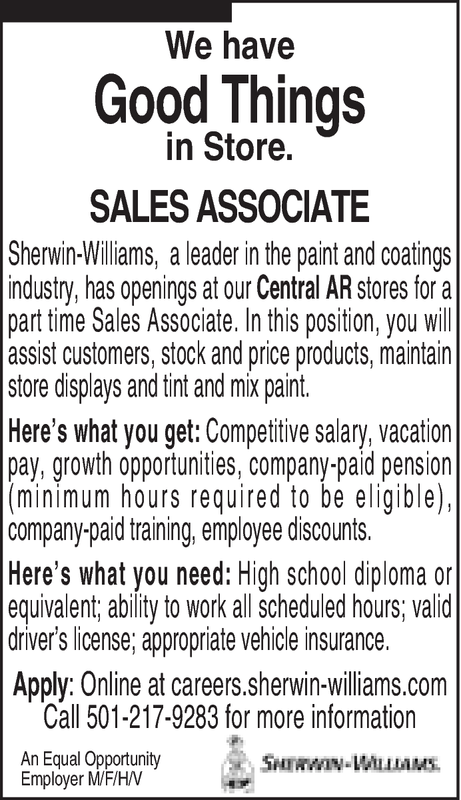 Sherwin-Williams, a leader in the paint and coatings industry, has openings at our Central AR stores for a part time Sales Associate. In this position, you will assist customers, stock and price products, maintain store displays and tint and mix paint. Here's what you get: Competitive salary, vacation pay, growth opportunities, company-paid pension (minimum hours required to be eligible), company-paid training, employee discounts. Here's what you need: High school diploma or equivalent; ability to work all scheduled hours; valid driver's license; appropriate vehicle insurance.